“A really great evening,fabulous and very welcoming hosts, wonderful food and 3 unique comedians: my face ached! "It was an intimate event. Indeed, it was more than a normal event, it gave me a chance to meet such lovely people and introduced to me amazing talented comedians; all this came with amazing Italian food. So, The Flairshare brought together talent, social networking, and food. We couldn't ask for more; it is amazing honestly :) "
"I really enjoyed the whole evening and left feeling I'd been very well looked after. The atmosphere was warm and welcoming and the food provided particularly delicious. Really excellent hosts - warm, enthusiastic and very attentive to their guests!" The Flairshare concept is amazing and a great way to end the week! Paul, Sabrina and Lucky are perfect hosts and so generous!" "A delightful evening of fun with charming hosts, delicious food and friendly and sociable fellow guests. 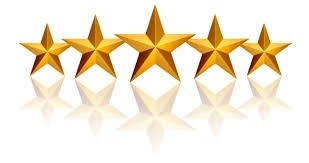 Sabrina and Paul looked after us very well and we were all made to feel welcome and comfortable"
"An amazing evening filled with warm and lovely people"
"I loved the atmosphere and the food"
“Astonishingly talented and approachable performer, great conversation, wonderful food. It was truly a pleasure to be part of this fantastic event. BeatFox thoughtfully explained beatboxing to newbies, super impressive yet unassuming guy. I was grinning with joy throughout the show. Hosts were warm, lovely, and carefully attuned to detail, ensuring we had an amazing time. “BeatFox is a very talented and passionate performer and he was amazingly generous with info and knowledge. It was an excellent all round experience, close and personal. "Welcoming hosts, delicious canapes, friendly people, talented performer. BeatFox was warm and inclusive as well as very talented. Hosts were warm, generous and genuinely welcoming"
"Fantastic talent, unusual yet unique. The act was really cool, everyone enjoyed it. I think it's such a great idea. It's something to get people involved and open to experiencing new things, things that you might not see everyday. It's also a nice way to let loose and de-stress. The company and hosts make it all the more worth while. It's a great platform for idea sharing and discovery. The food is brilliant and it definitely creates ways for people to start talking to each other, whether with the crowd or the acts themselves"
"A relaxing yet entertaining way to spend an evening in lovely surroundings. Everyone was welcoming and it was just a nice get together. Beatfox was very talented and knowledgeable about his art. The skill he displayed in mimicking different animals, his ability to beatbox even without a backing track was fantastic. Sabrina and Paul were great hosts: charming, welcoming and they provided a delicious selection of food"
"Great fun and nice people!" "Very nice evening with good food, amazing wines and stunning live performance"
BeatFox was an incredible and mesmerising performer. 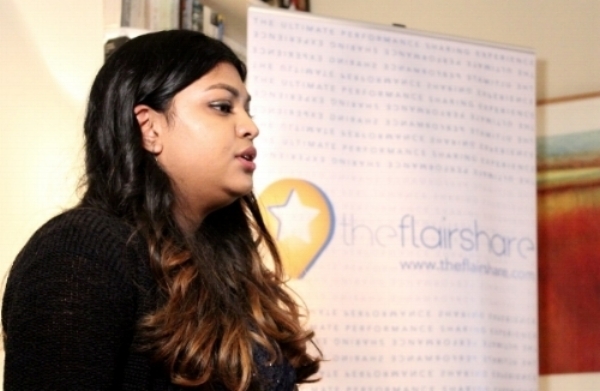 "This was my first flairshare event and it was amazing! Nick was great, I liked his songs and he was a good entertainer. Atmosphere, house, garden, food were outstanding. Sabrina and Paul were super friendly"
"Wonderful evening in an intimate and friendly atmosphere, with good food, subtle wit and a lot of fun. The performers lived up to the promise - they were funny, subtle and personable and the lively interaction between them and the audience was an added bonus. Hosts Sabrina and Paul are friendly and hospitable, with real commitment to their activity. They made everyone feel welcome and well looked after. "An evening of great food and humour! The performers were very engaging and the evening flew by. Hosts Sabrina and Paul are very friendly, including Lucky! "The event was a treat from start to finish. In addition to being very welcoming, every aspect was laid out in precise detail. I am thinking particularly of the catering and excellent setting"
"It was a fantastic evening and a good opportunity to see great talent in a relaxed and friendly atmosphere. Wonderful food, company and lots of laughter! Sabrina and Paul were so welcoming and overall the perfect hosts"
"Theflairshare is an extremely unique and varied experience. I met lots of deeply interesting people, the hosts are lovely and the food is yum! It’s also great in a city like London to come together and meet fascinating new people in an intimate environment. Thank you!" "Unusual experience in an intimate venue. Good opportunity to meet interesting people. Delicious home cooked food!" "Very innovative, entertaining and new experience. Great food, great entertainment, great night!" "A very warm welcome, informal and friendly surroundings with a fantastic performer, good company and good food. 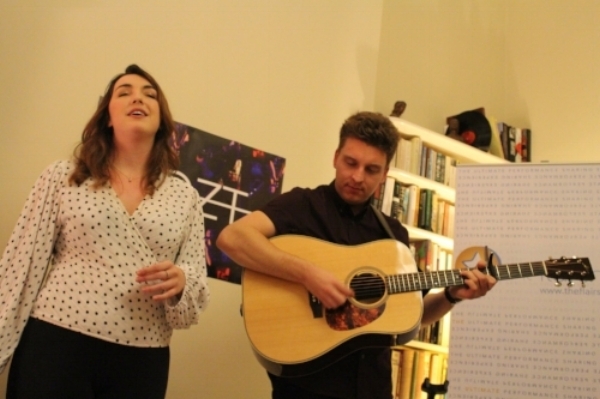 Helen's performance was professional and very appealing; the intimate setting in the living room was good for hearing the texts and the music in balance. It was personal and touching, yet not sentimental"
"Very pleasant evening with excellent entertainment,good conversation, tasty food and convivial hosts and guests"
"Intimate evening of musical magic!" 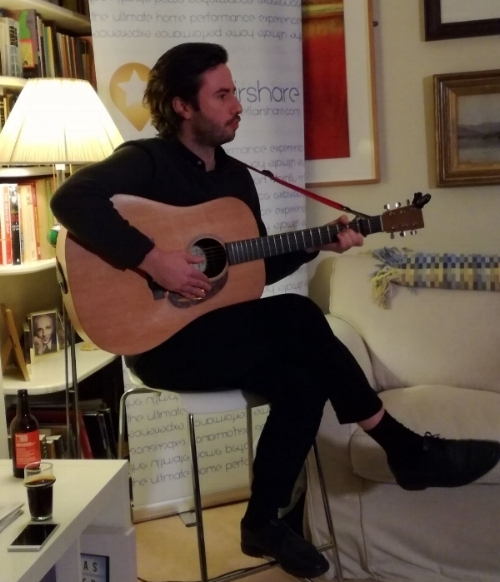 I liked finding out about new music, the setting in a very beautiful house, warm and friendly hosts, getting to meet new people, the Q & A session and I really enjoyed to find out the inspiration behind the music"
"Everything was perfect: hosts, food, music! Moreover it was a different and special experience in a lovely and warm atmosphere. A very intimate social event"
"Intimate setting, food, Q & A, excellent music and hospitality!" "I loved all of it: excellent food, hosts and music"
"This is a lovely new concept that opens people up to new styles of performances, new people, food, ideas....it is terrific!" "Having the performance in such an intimate setting, it really makes you listen to the music and words and makes the performance more powerful and emotional"
"I really liked the performer, the food and the intimate atmosphere; being so close to the performer and hearing his stories about the music. "I really loved Art personality"
"I really liked the hosts and the performance"
"I really enjoyed Art, the venue and the hosts"
"Music was just superb, the food and company were fantastic too"
"I loved the performance and the place"
"I loved the performance plus Q & A"
"Excellent performance and food. I have really enjoyed the evening!" "I loved the music! Great event!" "It was wonderful to be made to feel so welcome in Paul and Sabrina's home and meet lovely and interesting new people, all while supporting the musician and his original music"
"I enjoyed everything about the event: great food, great music and a lovely ambience"
"I honestly liked everything: food, people, music"
"The music and everything else was great! Thank you for a very enjoyable evening"
"Everything was in harmony: food, artist, atmosphere"
"I really enjoyed the originality and close up performance"
"Private evening with delicious food and entertainment. Nothing could be improved!" "The food was incredible (especially being a vegetarian) the artist was amazing and the company was lovely! Thank you for a lovely evening. Will be back for sure!" 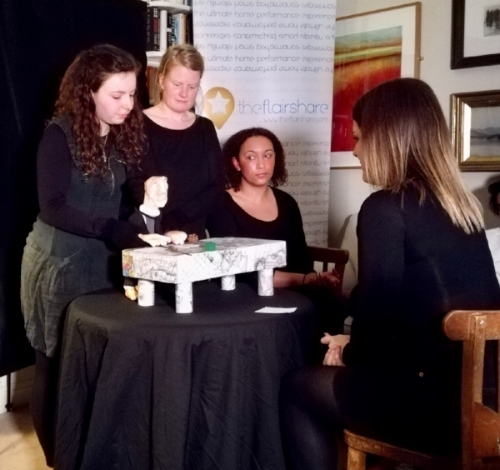 "I really enjoyed music, food, atmosphere"
"I loved the intimate, comfortable vibe, Q&A Session and the knowledge I gained from the performer. The event was perfectly set up. Well done!" "The performance and food were excellent"
"The group were so welcoming - as soon as we walked in it felt like old friends and a safe environment to perform"
"Lovely atmosphere. The musical performance was great and the food was excellent. loved the hosts"
"I enjoyed the performance very much and the food!! The lasagne is phenomenal!!" "The food was absolutely delicious, the music was breathtaking, and the company was so welcoming, A wonderful evening all round"
“Everything was really good. I loved the whole everyone being in one room.